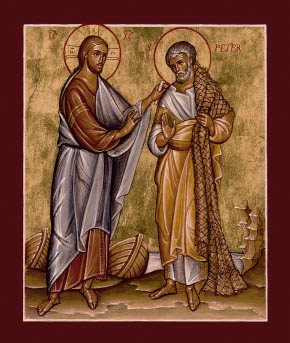 Today we look further at John’s story of Jesus’ resurrection appearance to the disciples on the shore of Lake Tiberias, with its special emphasis on Peter, from John 21:1-14 (Phillips). 21:20-21 – Then Peter turned round and noticed the disciple whom Jesus loved following behind them. (He was the one who had his head on Jesus’ shoulder at supper and had asked, “Lord, who is the one who is going to betray you?”) So he said, “Yes, Lord, but what about him? 21:24-25 – Now it is this same disciple who is hereby giving his testimony to these things and has written them down. We know that his witness is reliable. Of course, there are many other things which Jesus did, and I suppose that if each one were written down in detail, there would not be room in the whole world for all the books that would have to be written. After sharing a meal with his disciples, the risen Lord Jesus turned to one of them, Peter, and had a conversation that has long caught the imagination of those who have struggled and failed in their faith and long to hear the word of restoration. One key characteristic in this conversation is the difference in the word for “love,” which is brought out by J.B. Phillips in his translation above (“Do you love me?” vs. “I am your friend”). Though some scholars think the variations are merely stylistic, they may indicate more than that, at the very least the complex nature of the love between Jesus and Peter. Twice the question is framed in terms of love. And then a look at Peter’s future, with a cruciform ending like that of the Savior he represents. And the challenge: “You must follow me.” No matter the failures of the past. No matter the prospects of the cross which lie ahead. No matter what God’s will may be for others (see verses 20-23). Follow me. I had a pastor for nearly 15 years and can only remember one sermon he preached. It was his last and it was on the question Peter asked of Jesus and his response to him. I can relate to Peter not only in his denials but also in his question regarding John. It is so hard to simply follow Jesus the way he calls us to follow him without wanting to compare our situation to others. We can do this as individuals, as a family, a church, a culture. We want to know why our journey is so different from others (usually in a way where we feel ours is more difficult or why others seem to have it easier). But rarely does Jesus give us an answer to this question other than, “I love you, you can trust me, don’t worry about how you stack up to some one else, just follow where I lead you”. Peter eventually got it and I pray I will too.